To cast one look I would not dare. To slumber in its endless gloom. Within Fate's Fix'd mysterious book. It's been a while since I had a girly squeal... Well actually not I had a good squeal yesterday but today was super squeal when I saw the end photos for this post. [Toiz] Oh MY GOODNESS! I LOVED!! Tarot Deco contains a rug, lamp, floating tarot cards and a crystal ball. These items are mod so you can make them bigger or smaller. Each piece has there cute sparkle crystals. 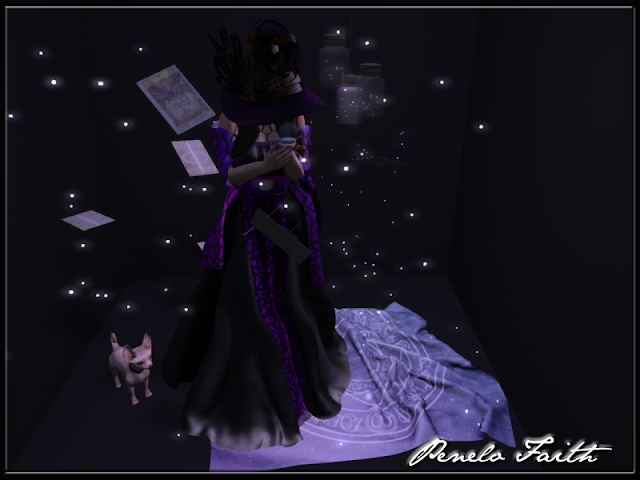 Facepalm outfit includes dress, shoes and a headband that you can see under my witch hat below. HINT: Play a little tune.